Clive pronounces at Des's party that he is sympathetically pregnant. Mrs Mangel tearfully tells Jane that Mr Mangel has gone and she never wants to hear his name mentioned again. Jim gives Scott a car and it crashes on its first run as Paul tries to avoid baby Sam's pram which is running down the street. Scott is hospitalised, Charlene tells him that she loves him and they get back together again. Clive regains consciousness at the boxing match as Mike and Shane agree not to fight. Charlene, Mike and Jane are waiting in the street for the postman to bring their exam results while Lucy plays ball. She asks why it takes so long to get the results. Charlene explains that it takes ages to mark the papers and then they have to be fed into the computer. Mike asks Lucy where Scott is and she tells them that he is going to have his cast off today at the Doctors. Mike asks Charlene how she got on with the motor mechanic apprenticeship job but she tells him she didn't get it-she hadn't thought there would be as much competition because of the numbers going off to Uni. Mike doubts if he will get a teaching job if he messes up his exams. Jane admits she doesn't know if she wants to get a job or go to Uni and Lucy cheekily suggests that if she has failed then she doesn't have to make a decision. Lucy spots the postie who quips that he has never seen so many people so keen to see him. He hands each of them their envelopes. Lucy takes Scott and Nicky's results and the rest of the mail. Charlene screams “I did it, I got through!” Jane and Mike chorus “So did I” Charlene hugs Mike as he spins her around as he chants “Plain Jane's a super brain!” Lucy wants to open Scott's envelope but Charlene stops her. They run off to find how others have got on. 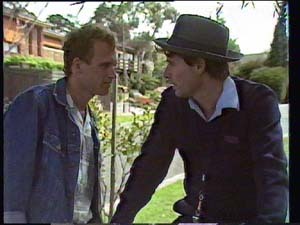 A stranger (dressed in ordinary clothes) stops the postie and asks him which is the Robinson house explaining that he is a friend. The postie points to the end house. Helen tells Lucy that they are allowed to open Nicky's but will have to wait until Scott comes home to find out his results. Lucy tells Helen that Jane, Mike and Charlene are really pleased with their results as Helen excitedly opens Nicky's envelope. Helen tells Lucy that Nicky has done very well as Lucy tells her Gran that it was because she did a lot of studying. “Let that be a lesson to you young lady” Helen replies. 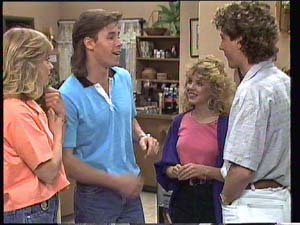 They hope that Scott will do as well but Helen acknowledges that he had lot on his mind at the time, like Lucy's accident and then the upset with Charlene. Lucy asks if Scott's car is going to be repaired now Scott's foot is better but Helen warns her not to mention the car in front of her father as he is very wary of cars since the accident. She sends Lucy out of the room and then anxiously picks up an Air Mail letter that had been delivered at the same time. Scott and Jim arrive home and Scott looks disappointed when he gets out of the car and cannot find his results in the mail box in the drive way. Scott whinges about the pressure they are under even after sitting the exams. Jim tells him not to worry – if he did well he could start to think about his future but if he failed he would kill him, Jim says, smiling. As they go inside the stranger appears and looks up the driveway. As soon as they arrive Helen hands Scott his results and they crowd around him as he warily opens it. He looks at Jim and sighs “I didn't make it… I'll never get into journalism with those marks” Helen tries to reassure him that he has always done well at English and they could always take into account his work during the year, but Scott reminds them that that wasn't too hot either. Jim suggests that they may take into account the external pressure that he was under but Scott yells that it is what's on this paper that counts and let's faces it I blew it, all right and storms off. Later that day Helen tells Jim that Scott needs some time to himself as he is absolutely shattered and they both blame themselves; Jim for putting all the blame of Lucy's accident on to Scott and Helen for going to America and not being there to support him. The phone rings and Helen tells Paul that Scott didn't get the marks he needed and could do with some moral support. Charlene, Mike, Jane and a friend (Dave) are celebrating their results. No more school, no more teachers and no more uniforms. 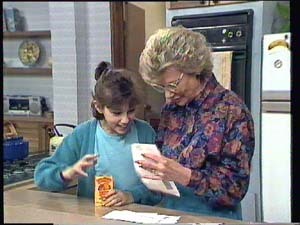 Charlene rings Madge and tells her the good news and asks her to stop crying. Charlene suggests to the others that she goes to fetch Scott but they all agree to go and find him to see how he did. Scott limps in to the kitchen and Helen apologises to him for them all letting him down. Scott replies that he is the one who let them down. “I'm the only dumb one in the family”. Helen reassures him that he is nobody's fool and would have passed under normal conditions. He tells her that he will not be going back to repeat the year. Helen suggests he appeals. Charlene, Mike, Jane and Dave burst in and Charlene eagerly asks Scott what sort of marks he got. There is a long pause…..
Everyone is embarrassed and Helen suggests that Scott needs some time on his own. Mike, Jane and Dave apologise for barging in and leave, while Charlene gently puts her arm around Scott, who has his head in his hands. She asks if he wants her to stay and he shakes his head. Scott limps past the Mitchell's house where he can hear party music. He nearly bumps into the stranger who tells him it is easy to be preoccupied. The stranger walks purposefully up to the Robinson House now dressed in a suit with a dog collar. The doorbell rings. The stranger introduces himself to Helen as Errol Price, the Chaplain of the Lincoln Detention Centre. Helen looks bemused. He explains it would probably mean more to her grandson Paul as his wife Terri spent some time in the Centre. Helen asks if the visit is to do with Terri. Rev Price evasively says that in a manner of speaking it has, since he got to know her quite well before she opted upon her tragic decision. 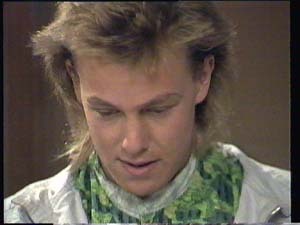 He tells Helen that he feels he let Terri down because of his age and in experience as a priest. What little he did learn was from prison records as she would not discuss it. Helen tells him that Paul and Terri were so happy when they married but it was as if a dream turned into a nightmare as she became embroiled with a man called Charles Durham. Paul was caught up in the middle. Rev Price suggests that there had been a shooting “or something” and asks Helen how it happened. Helen explained that Paul found a gun in her bag and realised that she must have been responsible for Charles Durham's murder. They argued and she shot Paul while he was trying to call the Police. She was tried and convicted and the rest you know. Helen continues that for a long time afterwards Paul tried to blot it out of his mind, he is became a cynical business man. He finds it hard to keep any relationship. 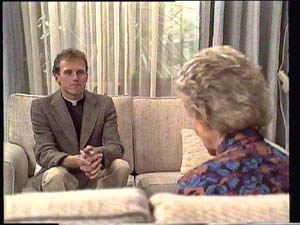 The priest says to Helen that Terri had told him that she had written a letter to Paul. Helen tells him that he didn't read it. He tried to act as if she didn't really exist. The Priest goes on to ask if it were true that Terri had asked to meet with Paul shortly before her suicide and he had refused. Helen tells him that was true, to which the priest replies that “these things are sent to test us”. Helen goes to the kitchen to brew some tea for them both. Jane tells Charlene that her Nan is acting oddly. She had shown her the results and she looked at “the most important piece of paper in my entire life”…“as if it were a shopping list”. Charlene describes Mrs Mangel as “A few spanners short of a toolbox…. Crazy….she's certifiable. They should put her dressing gown on backwards and stick her in a rubber room”. Jane is offended. They talk about there still not being any sign of Mr Mangel. Sitting down for a snack they all feel sorry for Scott as the journo course is so hard to get in to and agree that he has so much to live up to... Paul, “Mr successful” and his father too. They drink a toast to Scott while Charlene reminds them that he will need all his friends now. She wished that Scott had let her stay and talk to him. Rev Price is looking through the family photographs. He recognises Paul from the wedding photo in Terri's effects. He tells her that he feels guilty. He asks if he could say a prayer at the graveside but Helen explains she does not know exactly where that is as she was overseas at the time, but she knows the cemetery. He suggests that she join him. At first she declines but he persists and finally agrees but has to tell the others that she will not be in for lunch. She writes a note likening her role to that of an air traffic controller “you need a bold temperament, perfect timing and a nervous breakdown is always on the cards”. Helen put the note on the fridge but while she gets her coat Rev Price takes the note from the fridge door, screws it up and puts it in his pocket.